FILE - Indonesian Army's Kopassus special forces patrol outside the venues of the Asia-Pacific Economic Cooperation (APEC) Summit in Bali, Oct. 5, 2013. Human rights supporters are concerned by the potential relationship between the American military and an Indonesian special forces unit that has been linked to human rights abuses in East Timor, Aceh, and Papua. Kopassus, which is short for "Special Forces Command” in Indonesian, was founded in 1952 and its activities include unconventional warfare, sabotage, counter-insurgency, counter-terrorism, and intelligence. It gained notoriety for its abuses in East Timor during the Indonesian occupation there (which ended in 1999) and in the 1998 Jakarta race riots, when Kopassus was involved in the murders of and violence against Chinese Indonesians. The unit was strongest during the Suharto dictatorship, which fell in 1998, and has had a somewhat diminished stature in the democratic era. Mattis’s Indonesia counterpart, Ryamizard Ryacudu, expressed hope that the U.S. would reverse its sanctions on the unit, which were made in light of rights abuses in East Timor during that nation’s independence struggle in the late 1990’s. 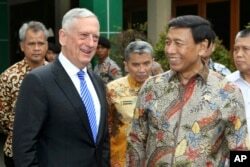 Mattis told reporters in Jakarta that the military would go through “established procedures” to consider reopening ties with Kopassus. Mattis’s Indonesia trip came at the heels of his strategy to strengthen foreign military alliances as a bulwark against Russian and Chinese power. But it’s unlikely that Indonesia will go out of its way to take sides, so to speak, between the U.S. and China. Although Indonesia has been lately vocal on issues in the South China Sea, that has more to do with its own sovereign interests than great power geopolitics. In fact, ever since founding the Non-Aligned Movement in the Cold War, Indonesia has taken pains to not to form explicit alliances with world powers like the U.S.
“Why is Indonesia careful about relations with China? Economics, of course,” said Arbi Sanit, a political scientist at the University of Indonesia. “Chinese investments in Indonesia have been rising steadily, so that is always a concern."